In this paper we show the potential of the scratch experiments controlled by Acoustic Emission (AE), to analyse, in a comparative way, the adherence of TiN and CrN films on steel substrates. The fact that the TiN films are ductile CrN films are brittle is clearly with the AE patterns and then corroborated with optical and scanning electron microscope observations. In the first case, (TiN), using AE, four stages can be detected in the fracture process of the coating, while the second case (CrN), only three stages are present along its microfracture process. In these stages we associate the kind of microfractures with the recorded AE features. Acoustic Emission (AE) is an important tool for the detection and characterisation of failures in the framework of non-destructive testing (NDE) [1-2]. In a previous paper [3-4] some of the authors analysed the detection of a TiN coating on a stainless steel sample. The analysed AE signal was obtained by a scratching test designed for adherence evaluation. The signal was treated in the frame of 1/f stochastic processes and an harmonic analysis method, showing promising results. But more systematic experimental work was necessary. In research work carried until the moment, seven samples with different coatings were analysed, and emphasis was put in the comparison between different stages in the scratching process, with the AE technique recorded during the experiment and the after test scanning electron microscope observation. In the meantime, some other papers involving scratch tests appeared in the literature [5-8], but the subject is far from having been concluded. The organisation of the paper is as follows: First the AE technique is described. Then we describe the procedure to obtain the TiN and CrN coatings on steel samples. In the next section the scratch test is described in detail. 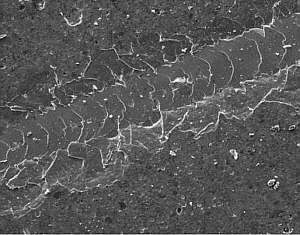 A thorough comparison between several AE parameters varying along the scratch test and the after test optical and scanning electron microscope images follows for the two kinds of films: one ductile and the other one brittle. Concluding remarks are presented at the end of the paper. Acoustic emissions (AE) are the stress waves generated by the sudden internal stress redistribution in materials or structures when changes in their internal structure are produced (crack initiation and growth, crack opening and closure, deformation, dislocation movement, void formation, interfacial failure, corrosion, fibre-matrix de-bonding in composites, etc). These waves propagate through the material and eventually reach the surface, producing small temporary surface displacements. Usually the stress waves are of low amplitude and of high frequency (normally, ultrasonic). This is the reason why very sensitive piezoelectric transducers (sensors) are required to capture them. Due to the low amplitude of AE waves, several steps must be sequentially incorporated after their capture and before the subsequent recording and analysis. A preamplifier is necessary to minimise the interference and prevent the signal loss, a filter to remove the noise and an finally an amplifier. Figure 1 shows a block diagram of this procedure. Fig 1: Acoustic Emission Technique. Commonly, the sources of AE are related with the damage in the material. Thus, its detection and analysis can be used to evaluate the dynamical behaviour of the material, and so, to predict its failure. In fact, this procedure is a nondestructive evaluation (NDE) technique of materials and structures, the so-called "Acoustic Emission Technique". The main difference with others NDE’s methods (X-Ray, Ultrasounds, Radar, etc.) is its capability to detect in real time changes occurring inside the materials. Thus, by using an AE system, we can continuously monitor in-situ the start and progression of the damage of the specimen or structure even when this is not possible by means of visual inspection. However, this technique is not free from some disadvantages which must be overcome in the future: limitations to carry out quantitative analysis, the unavoidable presence of noise, signal weakness, etc. Nevertheless, recent theoretical results and advances in electronics are allowing the high development of this technique for its use as a NDE method. Keeping in mind the way to analyse the wave stress recorded with the sensors, the AE can be divided into two types. The historically first one, called "Non Quantitative Acoustic Emission" or "Traditional Acoustic-Emission" technique, is based on obtaining some parameters of the recorded signals and their statistical study along time. Contrarily, the "Quantitative Acoustic Emission" takes into account the source-function and the wave propagation inside the material and/or a signal processing of the recorded data by means of high-level techniques. Obviously, the second category of AE technique is more difficult to implement both in theory and practice, but allows a higher quality information. In this paper we use only traditional AE. More concretely, this type of analysis is based on the assumption that the elastic energy is emitted as a sequence of events, as described later on in the paper. Each event, detected when the AE signal overpasses a threshold, can be defined with some parameters: Amplitude, duration, number of counts, energy and rise-time. Moreover, the number of AE events and the total elastic energy recorded (accumulated along the load history) are parameters highly used to evaluate the AE activity into the material. Seven samples were cut from a hot laminated slab and then polished. All samples were submitted to plasma nitriding in a process characterised by the following parameters: Temperature: 480 ÷C; Duration: 20 h; Gas composition: 25% N2, 75% H2; Total Pressure: 7 hPa; Pre-treatment: sputtering de-passivation during 2 h at a pressure of 2 hPa, in a gas composition of 50% Ar %50% H2; The nitride layers depth was in all cases between 50 and 60 µm. Five of the samples were re-polished. All the samples were then coated by PVD. The coating was either TiN or CrN. In this second deposition the layer depth was of some microns. The samples were nitrided by IONAR S.A. (Buenos Aires, Argentina) using industrial equipment. Details are given in Table 1. 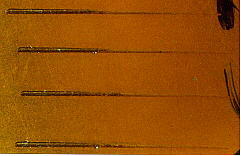 Scratch tests were performed under controlled conditions with a device that consisted of a loaded probe with a diamond indenter moving linearly along the sample with a constant speed and continuously increasing force.The steadily increasing contact load causes tensile stress behind the indenter tip (trailing edge) and compressive stress ahead of the cutting tip (leading edge). The detection system used was MISTRAS 2001 from Physical Acoustics Corporation (PAC). The piezoelectric sensor was located with a coupling wax on the topside of the sample holder. Then signals passed through preamplifiers (40 dB) and were measured by the AEDSP-32/16B card that has two channels for signal processing and wave shape detection. The parameters were: Pretrigger: 20 microseconds; Gain: 45 dB; Sampling Frequency: 4 Msamples/s; Duration: 2.2 s; Maximum load: 10 Kg. A scheme of the experiment is given in Figure 2. The breakdown of the coatings was determined both by AE signal analysis and optical and scanning electron microscopy. AE permits an earlier detection, because the shear stress is a maximum at certain depth beneath the surface, where a subsurface crack starts. Moreover with these coatings, the first cracks are so small that they are difficult to detect even under the microscope. They may even close-up within a few milliseconds and thus become optically "undetectable". Fig 2: Scratch-test scheme . As previously mentioned, several samples covered with two kinds of coatings have been tested. Figure 3 shows an optical microscope image where we can see the four scratches carried out on sample E, with a TiN coating. In all cases, the duration of the experiment was 135 s and the real length of the scratch is 1.02 cm. Figure 4 shows a similar image corresponding to sample D, covered with CrN. At the first scratch, the length during which the AE was recorded, was 1.05 cm and the experiment duration 140s. By means of visual inspection, a clear difference can be observed between both films behaviour: Whereas the TiN film breaks gradually, the CrN film suddenly breaks. In concrete, for the first scratch of the CrN the break appears at 4.6 cm (i.e. 61s or 44% of the experiment). Thus, we can conclude that the first one is a ductile coating and the second one is clearly a brittle one. This behaviour is also observed in the other samples, both with TiN and CrN. However, a more exhaustive analysis is necessary in order to better understand the fracture process. Figures 5(a-c) (located at the end of the paper) show scanning electron micrographs. Figure 5-a shows a spatial sequential image obtained by electronic microscopy of the first scratch performed on sample E (TiN). In this picture, a scale graduated in ten per cent showing the position on the scratch has been incorporated to help in the interpretation of AE results. (Optical microscope). 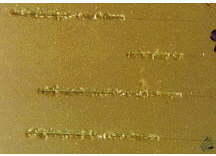 Fig 4: Scratches on sample D (CrN) (Optical microscope). The AE results obtained from one sensor and from the first scratch of Figure 3, are shown in Figure 6, where we are representing the energy of events, the accumulated energy, the duration and the rise-time versus the spatial position in %, which is proportional to time. These figures show also the load history. First, we can see that the first emissions appear about 25%. However, it is not until the 37% when these emissions have a significant energy. It is just at this point where the first transversal microfracture of the film appears (see Figure 5-a). Thus, we can establish a first stage in which a very-low AE value is observed, because the film is not broken yet or very weak microfractures are produced. We can see that the accumulated energy in this stage is flat and the events are very short. Continuing from here, some transversal microfractures appear on the film until approximately the 58% point. A new kind of fracture is presented in this second stage (37%-58%). We can see that the energy and duration of the events is higher than in the previous stage. Moreover, the accumulated energy slowly increases along the scratch. Fig 5a: Electronic microscopy image (Scratch 1, Sample E-TiN). So, we can associate these AE events to emissions produced by transversal microfractures. At the 58% position, an increase of both parameters (energy and duration) is clearly observed. Similarly, the accumulated energy increases its rate in a non-linear form until position 72%, approximately. At his point the slope increases strongly and remains constant until the end of the scratch. So, two new stages can be established: Stage III: 58-72% and Stage IV: 72-100%. At Stage III, we can see in Figure 5-a that the defects generated by the film detachment (debonding of TiN-steel the interface) are added to transversal microfractures (which continue appearing). Thus, two kinds of fractures generate AE events, which can not be easily separated. Even the change between both stages III and IV is not very clear in Figure 5-a, an increase of the fracture density (film transversal microfractures and film-substrate detachments) can be observed, showing a very high breakage degree of the film. Finally, an interesting result can help us to establish the separation between these two stages, because a clear change is appreciated in the rise-time values. Fig 6: AE parameters for Scratch 1 from Sample E (TiN). The AE results obtained for the first scratch of the sample D (CrN) of Figure 4 are plotted in Figure 7. First, we can see that the first significant emission appears about 44%, so verifying the result obtained with the optical microscopy image (Figure 4). However, to difference as the TiN case, the firsts acoustical emissions (from 44%) has a high energy (of the same order than the other ones along all the scratch procedure). This fact shows that CrN-steel type debonding microfractures are present from the first moment, due to the brittleness of the material (versus the ductility of the TiN). This result has also been verified by electronic microscopy. Thus, we can establish a first stage (I: 0-44%) in which a very-low AE values are observed, because the film is not broken yet. We can also see that the accumulated energy in this stage is flat and the events are also very short in duration. This stage is too similar to stage I for TiN. 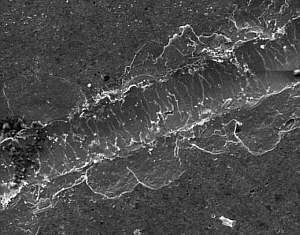 Continuing from there, some transversal microfractures appear on the film. However, contrarily to TiN, the debonding microfractures are also present due the brittleness of the CrN film (see Figure 5-b and 5-c to corroborate it). This is the reason why from thw 44% point the accumulated energy strongly and nonlinearly increases along the scratch. This increase is higher than in the TiN case. This behaviour is maintained until approximately 70% of the test duration, where a new change appears in the acumulated energy. Thus, we can define a second stage (II: 44-70%), which is comparable to stage III for the ductile film (TiN). Thus, by comparison of both materials, we can conclude that the stage II of TiN in which only transversals microfractures are present, is a typical feature of the ductile coatings, and it is not present in the brittle cases as the CrN are. Moreover, we can see that the energy and duration of the events in this stage II for the CrN is very similar along the scratch procedure, because the brittle debonding microfractures (with higher values of energy) are dominant over the transversal ones. Fig 7: AE parameters for Scratch 1 from Sample D (CrN). The non-linear behaviour of the accumulated energy is maintained until position 70%, approximately, where the slope increases strongly and remains constant until the end of the scratch. So, a new stage can be established: Stage III: 70-100%, equivalent to stage IV for the TiN. The beginning of this stage is also characterised by an increase of the fracture density. This increase, respect to previous stages, is mainly due to the film transversal microfractures, because the film-substrate detachments are present from the 44% point. Obviously, in this third stage a very high breakage degree of the film is observed by electronic microscopy (see Figure 5-c). Finally, an interesting result can help us to establish the separation between the stages II and III, because a clear change is appreciated in the rise-time values, as in the TiN case. At the third stage, where the breakage is very evident, events with a very long rise-ime are present. The total results are summarized in Table 2. Table 2: Stages for the samples E (TiN) and D (CrN). AE and microfractures. The surface acoustic waves captured by means of piezoelectric sensors has shown to be a promising method for characterising the adherence of thin films on steel substrates by means of scratch experiments with controlled load. Defects in both the film (transversal microfractures) and the interface film-steel (debonding) originate the failure of the coating. For the case of a ductile film as TiN, using the typical parameters of the non-quantitative AE technique and comparing them with the scanning images, we have demonstrated the existence of four stages. At the first stage, the absence of AE informs us that there are not yet important adherence problems (some or only a few fractures). In the second stage, some film transversal fractures conduce to low levels of AE energy liberation. The third stage is characterised by the presence of both types of fractures, showing thus a loose of film-substrate adherence, manifested by AE: high values of duration and energy of events, a clear non-linearity of the accumulated energy, and low values of rise-time. Finally, at the end of the experiment an increase of the density of fractures is traduced as a change of slope of the accumulated energy with very high values of rise-time. However, this analysis does not yet allow us to separate the events generated by both kinds of fractures in stages III and IV. As a summary, Table 2 shows these stages for TiN. This is the reason why more research must be done in the near future. Moreover, we have shown by means of optical microscopy images the clear difference of the fracture pattern between TiN (ductile fracture) and CrN (brittle fracture). For this second kind of film we have established, through the AE pettern, only three stages: I (without fracture), II (with both kind of microfractures) and III (with a very high microfractures density). This is the reason for which this brittle film can be considered broken at the beginning of the stage II, where the acoustic energy emitted is already considerable. The authors would like to thank to Cabo Amado and the IONAR S.A. enterprise, for their help in preparing the tested materials. I.G. Scott, "Basic Acoustic Emission", Gordon and Breach Sci. Pub (1991). C.B. Scruby, "Introduction to Acoustic Emission", C.B. Scruby, J. Phys, E: Sci. Instrum, pp. 20-94 (1987). R. Piotrkowski, G. A. Hirchoren, M.P. Gףmez, C.E, D'Attellis, y J.E. Ruzzante "Acoustic emission signals from a coating breakdown, 1/f processes and wavelet analysis", , Actas de Primer Encuentro Latino-Americano de Emisiףn Acתstica, E-GLEA 1, 6-10 Setiembre 1999. p.p. 177-188. A. Gallego, R. Piotrkowski, J. Ruzzante, A. Cabo, MT Garcםa-Hernבndez and E. Castro, "Acoustic emisiףn technique to assess microfractures of metalic coatings with scratch-tests". Forum Acusticum Conference, Sevilla (Spain), September 2002. D. Dalmas, S. Benmedakhene, C. Richard, A. Laksimi, G. Bיgenger and T. Grיgoire, "Caractיrisation par יmission acoustique de l’adhיrence et de l’endommagement d’un revetement: cas d’un revetement WC-Co sur acier", C.R. Acad. Sci. Paris, Chimie/Chemistry 4 (2001), pp. 345-350. Y. Garchon and C. Hיnau, "Study of mechanical behaviour of diamond-like carbon coatings by several instrumented tribometers", Thin Solid Films 377-378 (2000), pp-360-365. H. Ollendorf and D. Schneider, "A comparative study of adhesion test methods for hard coatings", Surface and Coatings Technology 113 (1999), pp. 86-102. H. Ichimura and A. Rodrigo, "The correlation of scratch adhesion with composite hardness for TiN coatings", Surface and Coatings Technology 126 (2000), pp. 152-158.